Wakefield, Virginia (CNN) – Mark Warner was weaving his way through the crowd on a chilly Wednesday afternoon at the Shad Planking, the annual Virginia fish fry that brings beer-sipping politicos together in the tall pines of southeastern Virginia, when a burly man sporting an NRA sticker approached. “Senator, did you read the Affordable Care Act before you voted for it?” he asked. Warner, his brow furrowed earnestly, was prepared. The Democrat moved along briskly, back-slapping longtime supporters but also facing down several more questions about the health care law he supported from hostile interrogators, most of them backing Republican Ed Gillespie, his likely challenger this year. With his signature grin and rolled-up sleeves, Warner answered them all like the seasoned politician he is. But the specter of the Obamacare pecked at him throughout what was supposed to be a light-hearted afternoon of backwoods politicking and friendly bipartisan joshing. Warner has a big lead over the little-known Gillespie early polls, and the Republican still has to secure the Senate nomination at a convention in June. But inside the event, Gillespie supporters appeared to outnumber Warner backers by a wide margin. Gillespie had arrived earlier, trailed by staffers and a small horde of volunteers hoisting campaign signs. The first-time candidate, a veteran GOP fixer and lobbyist, worked his campaign booth, handing out beer and taking questions from reporters. 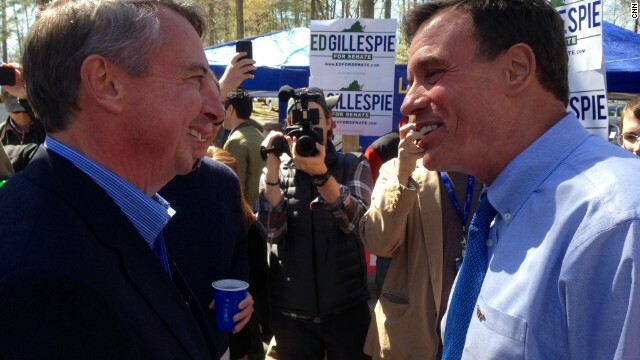 On his way out of the woods, Gillespie bumped into Warner, the first time the two have crossed paths as rival candidates. They chatted briefly about Terry McAuliffe, the new Virginia governor who chaired the Democratic National Committee a decade ago when Gillespie ran the Republican National Committee. Warner was booked as this year’s headline speaker. He was introduced by John Hager, a former GOP lieutenant governor, who heralded the event’s bipartisan conviviality. “Looks like there’s lots of good gettin’-together,” he chuckled as he surveyed the audience. It wasn’t always that way: The event was started by the segregationist Democrats who used to dominate politics in the commonwealth. Today, women and African-Americans are allowed to participate, but the Shad Planking retains a conservative bent. Wednesday’s vest-wearing crowd was mostly white and mostly male, part Garden and Gun, part Guns and Ammo. In keeping with the spirit of the day and his own political centrism, Warner avoided charged rhetoric in his brief talk on stage. A former governor and Democratic Party chairman, it was his fourth career appearance at the Shad Planking. He had warm words for the Republicans sitting next to him on stage, including George Allen, the former governor and senator who had a wad of tobacco stuffed into his lower lip. Warner declined to roast Gillespie, as speakers often do with their opponents here. His jokes were instead about Virginia’s shifting electoral landscape. His speech was peppered with feel-goody nods to “the Virginia way,” commonwealth shorthand for a genteel manner of across-the-aisle deal-making that “produces results.” The happy talk glossed over the grid-locked realities of do-nothing Washington and the ideological warfare unfolding in the state capital of Richmond, where a battle over Medicaid expansion could force a government shutdown. Warner huddled with the press after his speech. They wanted to know what elements of his Senate record he would feature in his campaign. He was quick to pivot back to his accomplishments as governor, mainly his landmark 2004 tax reform deal and successful efforts to boost Virginia’s business-friendly reputation. “What Virginians have always appreciated is people who get stuff done,” he said. But what about his Senate record? He punted when asked if he would welcome President Barack Obama to campaign with him before November. As examples, Warner pointed to entitlement reform and energy policy, specifically his support for the Keystone XL Pipeline and offshore oil and gas drilling. “So that’s a maybe?” a reporter followed up. Warner was already moving on to shake the next hand. Which translates as, "No, I just followed orders and did what Harry Reid told me to do." It seems democratic segregationist are going to be a endangered species in Va . but boy they still try to use that race card only in reverse gear now days . Whats next ? I kn0w ! Another Big 0 Lie ! What will they n0t say or d0 for a vote ? N0t a darn thang ! Amazing how these knuckle dragging, nose picking right wingers don't want insurance, and don't want anyone else to be insured as well. Bet if they have a medical condition that needs a lot of care, they don't shy away from going to a hospital, even if the rest of us have to foot the bill. Democrats don't need to run away from Obamacare! it's a good thing for the country for the vast majority of Americans to have health insurance. the alternative is everyone paying for the uninsured to get treatment at ERs. or folks dying from treatable illnesses because they can't afford treatment. or folks disabled for life and becoming a drain on society because they couldn't get preventive treatment or tests. the 'right' is ok with these things. decent people are not! we Dems should be very proud of our president and his success in getting Obamacare up and running. more people are seeing its benefits every day, and we need to run on the good it's doing and how the repugs want to take health care away from the American people. I hope when Warner is trying to show his independence,"I work with the President BUT I diagree with him on a few things . . . ", that he takes the opportunity to beat back the GOP/ FOX echo chamber speakk by asking Bubba, Johnny-Ray, and Clem if they think an insurance company should be able to drop you from coverage in the middle of your cancer treatments because you`ve reached your "lifetime max"? He should MAN UP and at least indirectly embarass the Republicans for their wholesale opposition to the good in Obamacare. He needs to educate these hicks, even if he does so in an obtuse manner. For the record, Mr. Gillespie's "small horde of volunteers" included a good number of Republican women. Warner's feeble attempt at humor/thinly veiled GOP "war on women" crack was not warmly received by the crowd. I know, because I was a Republican woman sitting in the front row. what will republicans do if Obama care is a big success?. Report the other day said it is coming in at 5 billion less than thought. People keep signing up and insurance premiums expected to go down. What new lies will they come up with?? What about Sarvis, the Libertarian? He was there, too! he didnt read obamacare before voting YES for it. he cant come to admit that. we dont need people in dc or anywhere, that vote like the three blind mice. really really stupid. kind of like "you can keep your doctor. period. you can keep your policy period." all lies from the get go. i dont like to be lied to as a democrat. it isnt right. What Virginians need more than more gun holsters to be able to show where their man/womanhood really lies is Medicaid. -–obamacare is a dire need of USA. All these years, republican corruption made a stoppage of passage of legislation linked to insurance bribe. ACA IS A LAW, WORKING GREAT. Everything the gop says is a lie, everything they do disgusting, SMH . What are the implications when a former lobbyist, Gillespie, wins a U.S. Senate seat? What are his priorities? What an interesting tidbit of history, tucked away in the middle of this essentially non-story. And isn't it nice that even though this is still considered a conservative event they "allow" women and African-Americans in? !